"It was extremely tough, Kush was especially quick from the middle of the race and particularly at the end. I have to say a big thanks to my team, the guys at Double R have done a great job so far this weekend, the car has been mega all the way through. "I kept pushing away, trying to do my job and converted the pole into a win, it's the best way possible to start the weekend. "I saw Kush had a try and we were side by side for a few corners. The track is wide and in tomorrow's race it should offer some overtaking possibilities for me. I'm going to be with all the quick guys at the back in race two, so it will be tough but I'm looking forward to it." "A massive thanks to Lanan Racing, they gave me such a good car today and definitely a car I could have won with. We finished second, which is not what we wanted. "I definitely felt like I was quicker but through Maggots and Becketts it was really hard to follow so I had to give him a gap so I could attack into the last sector, but he had me covered." Double R Racing's Linus Lundqvist stretched his championship lead with a lights to flag victory in the opening race at Silverstone, holding off a late charge from Lanan Racing's Kush Maini to take his fourth win of the season. Maini was just 0.392s behind at the chequered flag, with Jordan Cane taking third for Douglas Motorsport, having closed right up to the top-two in the closing stages. Clement Novalak claimed fourth for Carlin, holding off a race long threat from Douglas Motorsport's Jamie Chadwick in fifth, with Nicolai Kjaergaard sixth for Carlin. Jusuf Owega claimed seventh for Hillspeed after a late move on Carlin's Billy Monger, with Krishnaraaj Mahadik and Tom Gamble completing the top-10. Lundqvist and Maini both made good starts to lead into Copse on the first lap, with Cane getting off the line well to claim third from Novalak. Further back, Kjaergaard was making amends for his seventh place qualifying to pass team mate Monger for sixth place, while Mahadik had a great opening tour to rise from 15th on the grid to claim 10th at the end of lap one. Lundqvist's lead was almost eight tenths after the opening lap, but from then on Maini was fractions quicker, and brought the margin down to just under half a second by lap seven, with Maini setting a new BRDC British F3 lap record around the newly resurfaced Silverstone Grand Prix circuit in the process. On lap eight, Maini was close enough to Lundqvist to attempt a move. Exiting Aintree corner, he was firmly in the slipstream down the Wellington straight, and was close enough to challenge at Brooklands. He was alongside but took the outside line at Luffield, with Lundqvist holding him off across the line starting lap nine, with the pair separated by just over a tenth of a second. The pair were close again at Copse at the start of lap nine, with their scrap almost bringing Cane into the battle for the lead. Lundqvist stretched the margin back out to almost half a second starting the last lap, and held off the Indian driver to win by just under four tenths, to increase his championship lead to 48 points. Maini's second place puts him much closer in the championship standings to Kjaergaard, while Cane climbs to seventh overall. Ravishankar made a good start from pole to lead into Copse on the first lap, while Arvin Esmaeili initially held second place after climbing from third on the grid with Charpentier holding third. There were good starts also for Kjaergaard who gained four places on lap one to run eighth, and championship leader Lundqvist, who climbed to ninth. 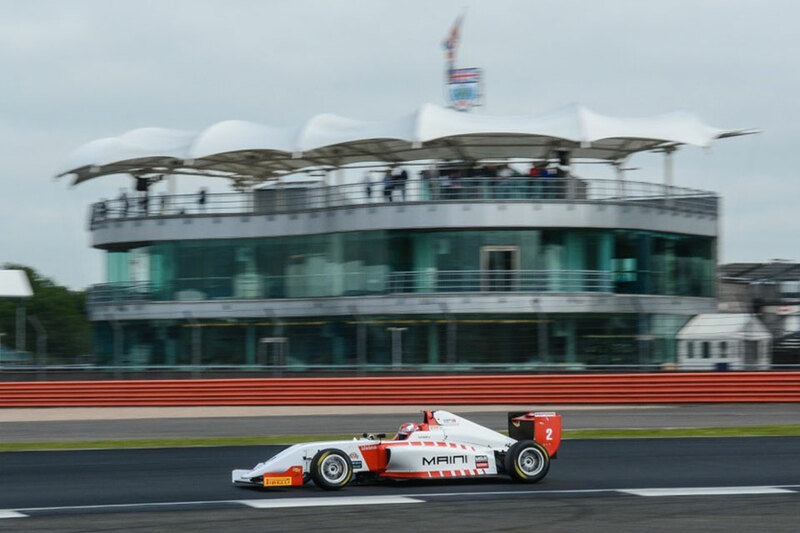 Further back there was trouble for race one podium finisher Kush Maini at Village, which relegated him to the back of the field while Manuel Maldonado, who had made a good start, had spun at Luffield, forcing him to pit. The third race of the Silverstone weekend starts at 17.15, with Lanan Racing's Kush Maini on pole position. Maini set the fastest race lap of the weekend so far in yesterday's opening encounter, and lines up at the front of the grid for the second time in British F3. Alongside him on the front row will be Tom Gamble, the Fortec driver setting a lap time in race two that was just 0.015s away from Maini's best effort. Race one podium finisher Jordan Cane will start third for Douglas Motorsport ahead of championship leader Linus Lundqvist. Fortec Motorsports driver Tom Gamble claimed his second win of the season with a dominant display in the third race at Silverstone. He claimed the flag by over two and a half seconds from championship leader Linus Lundqvist, while pole sitter Kush Maini had to settle for third. Nicolai Kjaergaard was fourth for Carlin, half a second ahead of Jordan Cane, with Clement Novalak sixth. Manuel Maldonado, Jusuf Owega, Tristan Charpentier, and Krishnaraaj Mahadik completed the top-10. At the start, it was Gamble who had the best get away from second place on the grid, with Maini dropping to second. Maini attempted to fight back at Maggots and Becketts, with the pair side by side. Maini came off worst in the encounter, running off track and surrendering second place to Lundqvist, who climbed from fourth to second by the end of the first lap. From there Gamble controlled the race, with the Brit leading Lundqvist by almost a second at the halfway stage, a gap which increased to 1.5 seconds on lap six, almost two seconds by lap seven, and 2.5 by the chequered flag, claiming his second victory of the year in the process. Lundqvist's second place ensures he ends the day with a further extended championship lead, with Maini solidifying his third place in the standings with his second podium of the weekend.